An island garden is one that sits alone in your yard surrounded by lawn. Such a garden is meant to be viewed from all sides; therefore, some serious thought should be given to the planning and planting of an island garden. I have seen numerous island gardens where the homeowner has planted some type of tall ornamental grass, such as pampas grass, in the center of the island garden. 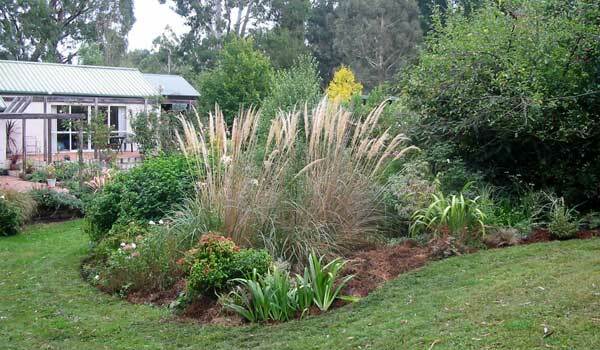 Around the ornamental grass would be planted a circle of the same kind of plant; e.g., salvia or clumps of catmint. A final third circle would consist of an even lower growing type of plant – for instance, some type of ground cover. I have seen other island gardens that consist of a bunch of blooming perennials, with no method to the madness. Shorter perennials are lost in the middle of taller plants. In addition, one or maybe two of a species of plants are represented, giving the garden a disjointed look. Not all island gardens need to be quite so boring, on the one hand, or such an example of disorganized chaos (as opposed to organized chaos) on the other hand. To create an interesting island garden that is also aesthetically pleasing, first survey the area you intend to plant. Although, your island garden will stand alone in your yard, other parts of your landscape will have an impact on the overall look of the garden. For example, your house may stand out in the background; or a wooded area at the edge of your property will be prominent. Such features in your landscape will influence the plants you will choose for your island garden. 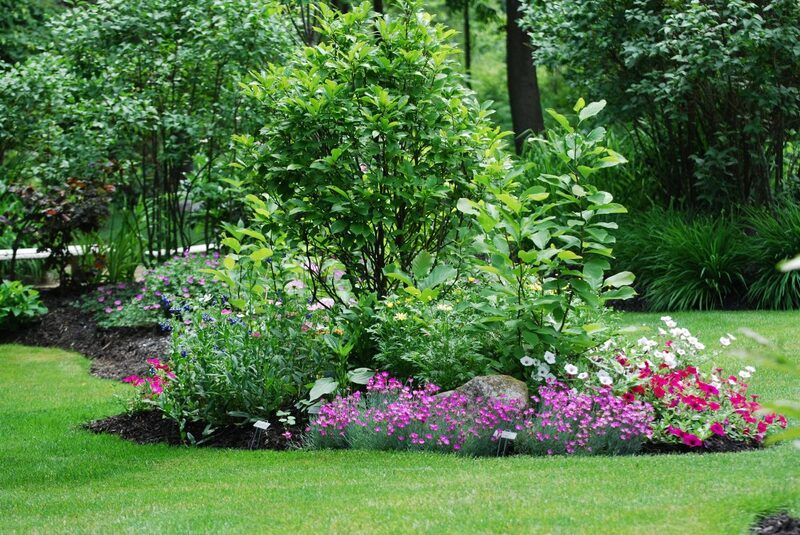 In addition, the size of your garden will be a factor in the planning of your garden. However, a small garden does not necessarily mean you need only choose small plants. Probably the best way to explain how to create an island garden is to share with you how I created one in my yard. I designed a small egg-shaped island garden in my backyard. On the fat end of the egg shape, I planted an 8-foot tall weeping spruce. There is a tall slender tree stump on the small end of the egg shape and to this I attached a birdbath. In the “back” of the garden (by “back,” I mean the side facing the neighbor’s house behind my property), I put up a short wooden trellis and planted flowering vines. I built up a slight mound around the tree stump birdbath and planted some mountain bluets, also known as perennial cornflowers (Centaurea montana). Between these and the weeping spruce, I placed a blue ceramic pot planted with annuals (sweet pea and nasturtium). I will be able to replace the spring and summer annuals with fall flowers later. At the moment, I have two small heath (Erica carnea), bushes planted at the “front” (the side facing my house). Of course, I will eventually have to move these, because they will become too large. I will probably replace them with something lower-growing that will complement the Centaurea. On the far side of the tree trunk birdbath, I planted a winter creeper euonymus (Euonymus fortunei), which has bright green leaves and large edges of a creamy yellow. This is planted on the down-slope of the mound and adds some bright color to the garden. Eventually all of these plants will grow and spread, filling in the garden. This description of how I planted my island garden illustrates how such a garden can be designed. It does not have to look the same from all points of view. Neither does it have to be a flat space. You can create mounds and slopes to add interest. In addition, you can use trees, such as a Japanese maple, to anchor the space. You can also use shrubs, ornamental grasses, blooming perennials, containers of flowering annuals, and even yard art to create textures and to give depth to the garden. Island gardens do not have to be laid-out in perfect circles either. They can be egg-shaped like mine or even designed with sharp angles, such as a square or even a triangle. 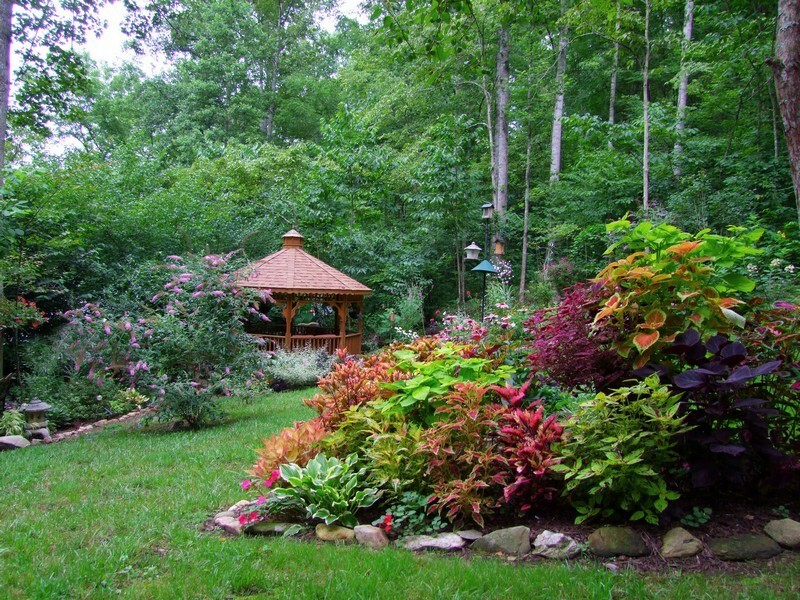 An island garden can work well in any yard – large or small. It can also give you a garden around which you can walk and view a seemingly different garden with each step you take and, yet, which comes together into a cohesive whole. Think of it as an island of plant life springing up in the green sea of your lawn.